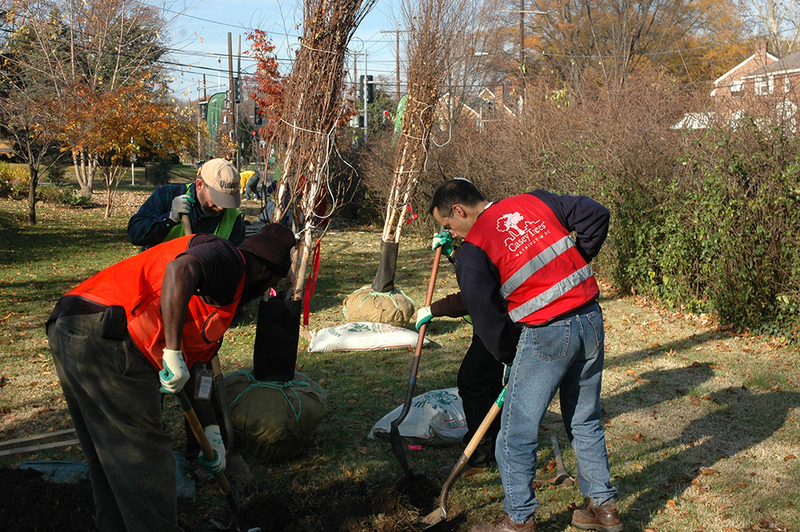 Northeast DC just got a little bit greener this weekend. Casey Trees staff and volunteers had a pleasant autumn Saturday planting trees at two locations in Northeast. In a Community Tree Planting organized with the Michigan Park Citizens Association, nineteen Casey Trees volunteers planted fifteen trees, including Allegheny serviceberry, river birch, Deodar cedar, Japanese cedar, honey locust, Foster’s holly, tulip poplar and American elm. This is the second planting we've done with the Citizens Association, and we have another one planned for Spring 2011. Our thanks go out to Lead Citizen Forester Mariuccia Marolo and Project Organizers W. Thomas Lavash and Lori Moller for making this event possible. We worked with the Edgewood Civic Association to plant 25 trees (cherries, river birch, katsura, southern magnolia and sweetbay magnolia). One southern magnolia was planted in the name of Kenyatta Stanley, a teenager killed by a stray bullet in 2009. Attending the memorial shoveling of the soil were her mother, Sharon Stanley; her sister and brother. We had a turnout of 46 volunteers, including fifteen of our Citizen Foresters, Councilmember Harry Thomas, ANC Commissioner Silas Grant, and members from Greater DC Cares and the Edgewood Civic Association. Thanks to Lead Citizen Forester Scott Opis and Project Organizer Tim Clark! After a short break for Thanksgiving, we look forward to meeting more volunteers who want to help out in Crestwood on December 4th. Sign up on our website.